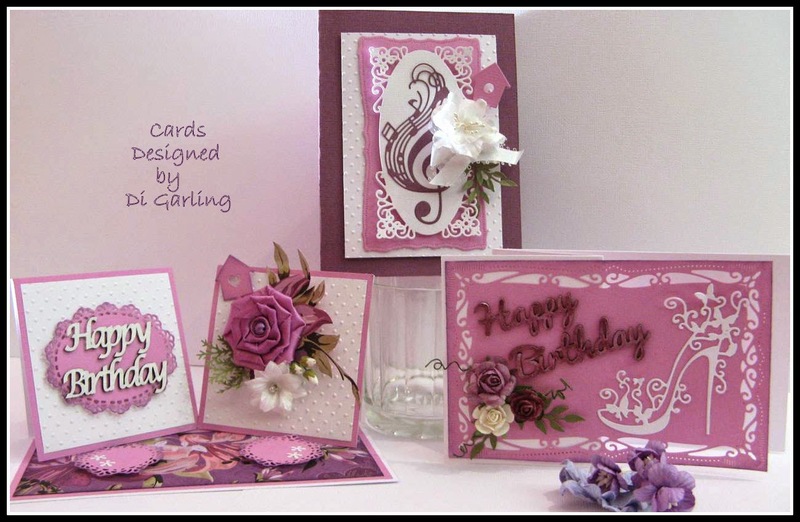 Hi there everyone, thought you might like to have a look at the cards Di has designed for her June card classes. The one on the left is a "Double Easel Card", so very pretty. Di has used some of our NEW dies we have available in the shop, don't you just love the high heel shoe? That is a newly released die from a new company, Tattered Angels. So so fine & delicate. The big music note is also another new release die we have in stock. Make sure you pop in store & check them all out. We have so many new dies on order & they are all starting to filter in. She has also used lots of beautiful Green Tara flowers. Cost is $35 for the 4 hour class & includes all materials. Even if you are a beginner we help you along the way & you will soon be making cards like a pro. Ring the shop on 433-44451 to reserve your place as our card classes fill up quickly. Hope to see you in class.